Today’s mail came with a sweet hand-written note from Teri in Room 29 in Califormia. 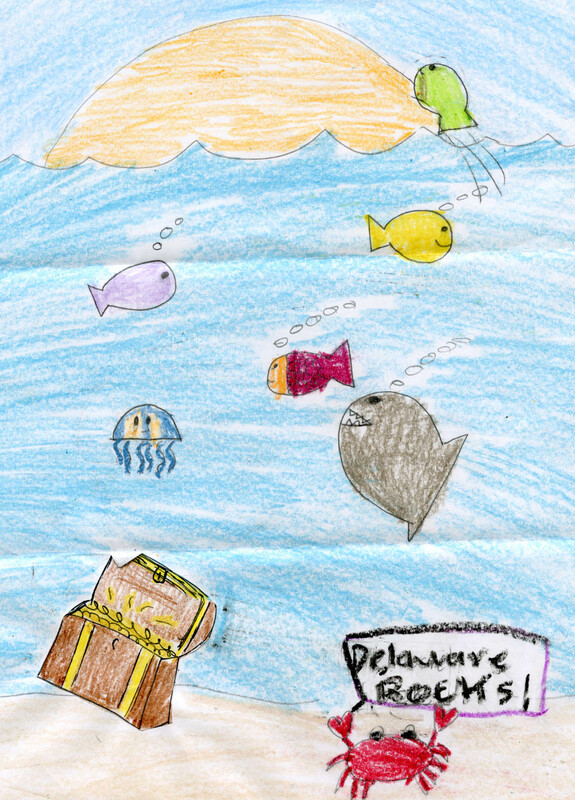 A couple of months ago, Teri wrote to us asking for information on the state of Delaware. Vicky, the Executive Assistant, answers student letters like Teri’s. She laughed so hard at this one because Teri explained to her that she chose Delaware because it has great seafood and “juicy history.” We didn’t know what it meant, but it was funny! Vicky did her thing and put a package in the mail to Teri. Today, she got a “thank you,” the first one she can ever remember receiving from a student request. It turns out that young Teri has a bright future for a variety of reasons from our vantage point. She wrote to let us know that she and her friends had made us a picture. This letter makes us smile as much or more than the “juicy history” remark. We’re glad to know that someone in California thinks our state rocks! Perhaps you were wondering: what was the Curator of Education at the Read House and Gardens doing at 11:45 today? I would hate to leave you in suspense! 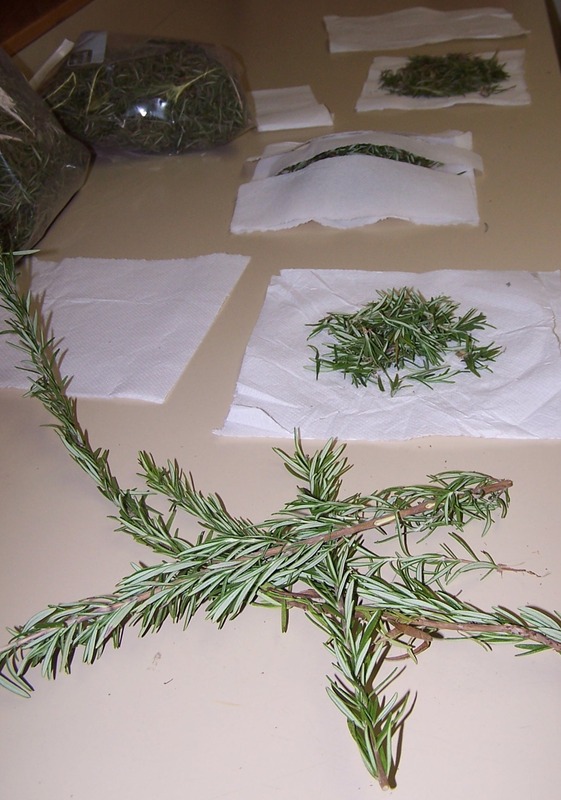 Well, at 11:40am I was drying herbs, rosemary to be exact, in the microwave (two minutes on high, between paper towels, hit “start”- and keep an eye on them, wouldn’t want them to catch fire!). 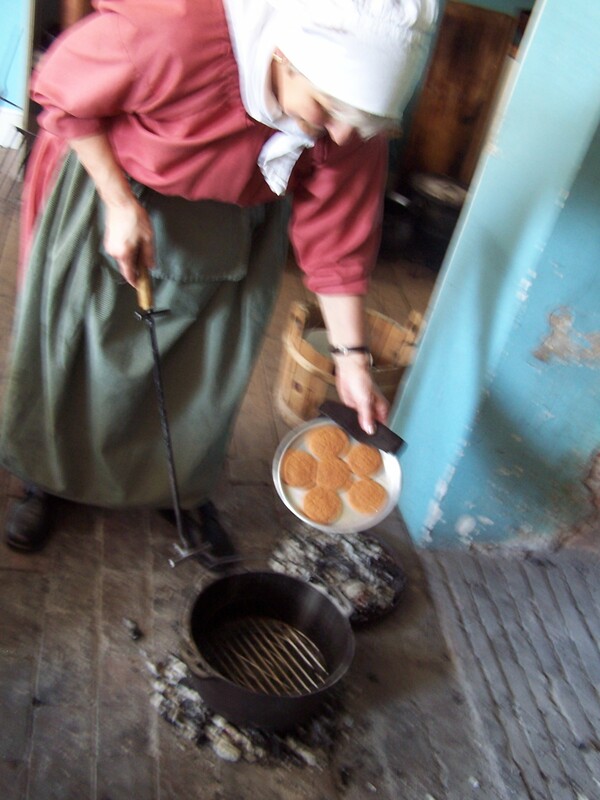 We use the herbs for grinding with mortar and pestle with school children for Frontier Delaware, at the Delaware History Museum. As the microwave beeped for the 3rd time it dawned on me, 11:45 was nearly upon me, so I hurriedly explored much more intriguing work going on around me here at the Read House! 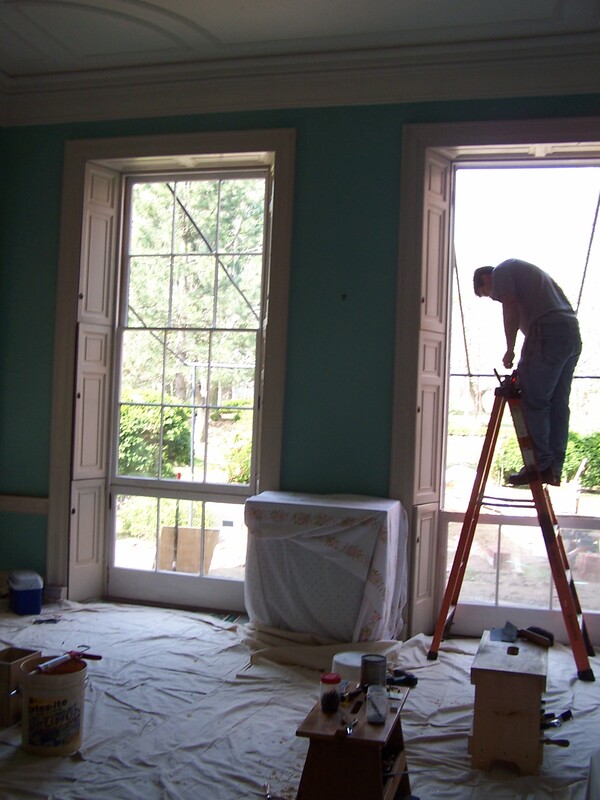 At 11:45, Chris, a carpenter (from JS Cornell) working on our Save America’s Treasures exterior restoration project, was busy reinstalling our second jib window in our Back Parlor. How joyous we are to see one of those jib windows back in place, luring us to the garden in this gorgeous weather! A jib window acts as both a window letting in a flood of light and as a door: the middle window slides up, and the bottom window (on a hinge) swings in, providing great space for people to walk out into the garden. Today we do not use the jib windows in this manner, but they are breathtaking to gaze upon nonetheless! 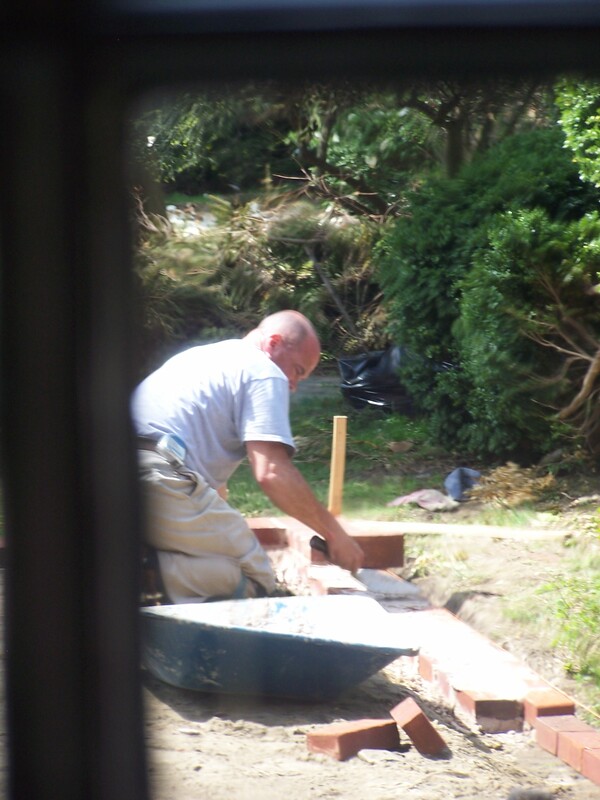 As I walked from the Back Parlor toward our historic Kitchen, picking up the aroma of something besides rosemary, I caught a glimpse of a mason troweling mortar and laying the brickwork for our terrace. It will be a welcome change to have another access way to the house, as we will be bombarded with thousands of school children this spring, who will undoubtedly march along our brick walkways from our back garden gate and stop at the terrace to discuss their “museum manners”. I poked and prodded the last burning log to encourage it to drop to coals and by this time 11:45 had passed. Back to the rosemary, paper towels, and two minutes. I wonder… what were you doing at 11:45??? It is with a sad heart that this 11:45er is saying goodbye to the Delaware Historical Society. Today is my last day working for a truly wonderful organization – one that I have been honored to be a part of for the past six and a half years. It is a place where I have grown both professionally and personally and a part of my heart will always be here. One of the ways the Historical Society truly allowed me to spread my wings was in social media. Never in a million years did I think I would become interested in technology. Yet here I am – blogging, tweeting, and following tech news with a passion I never would have expected. I count myself as truly lucky to have been a part of an organization that gave me the room to try these things and also to discover myself along the way!!! Thank you all for your support in our blog, for following this project, and for your words of encouragement! Aerial view of Dover Downs ca. 1965. I’ve been cataloguing a collection of photographs representing the professional work of Cypen Lubitsh and Jack Bungarz. They operated Lubitsh and Bungarz, a photographic studio in Wilmington from ca. 1950 until 1989. I opened a folder to describe it for the on-line cataloguing project and could hardly believe my eyes! 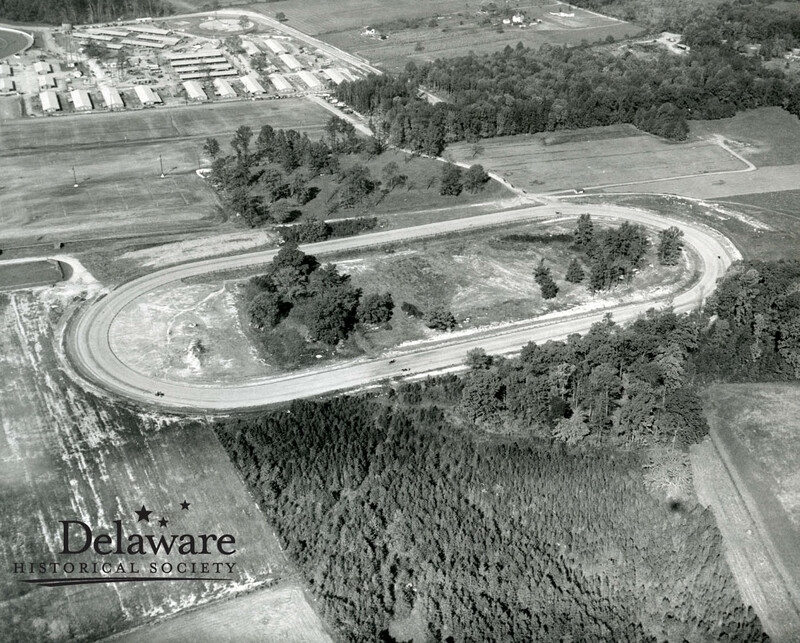 Here was an aerial view labeled Dover Downs. But what I saw in this view from about 50 years ago blew my mind- what changes time has wrought! These days, a racing weekend at the Dover International Speedway means busy lunch counters and hotel/motel rooms all across the state. Here was a view of a well-groomed track in the middle of almost nothing. A few horses trot around the track but where is the giant monster holding a truck in the air, where are the lots of trailers parked for a race weekend, where are the slots, casino games and hotel? And, where is Route 1 that passes so close to the rear of the track?!! Wow! (For those of us who have been around, it is easy to remember the track before it was “really big” with slots and the 46’ tall giant monster statue. This stunning view was taken before the outside, racing track was built, and maybe even dreamed about. Today the complex covers 750 acres. 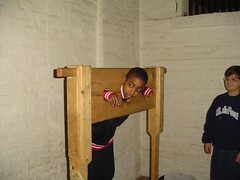 Who says history at the Delaware Historical Society is boring. Ha! Delaplane, originally uploaded by Delaware Historical Society. 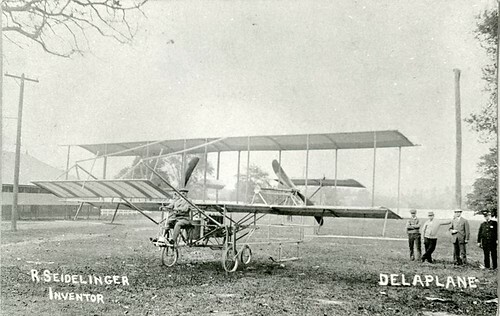 Robie Seidlinger, engineer and builder sits at the controls of Delaware’s first aeroplane. This was taken at the Horse Show Park, now a fashionable neighborhood known as Wawaset Park in Wilmington. One hundred years ago the Wilmington Aero Club (WAC) was incorporated. The organizers included David Snellenberg, Robie Seidelinger, George W. Crowe and John Montgomery. They contributed $1000 and sold shares in their enterprise which they hoped would allow them to develop a world-renowned aviation experimental group. The long range plan included highly publicized air-shows and innovation. At the time, they knew they could purchase a Wright (you guessed it- the Wright brothers) Flyer for $5,000 but instead the men opted to spend an estimated $6,000 for member Robie Seidelinger to design and build a plane. He did just that and in August, 1910 the Delaplane was nearly complete and was displayed at the fairgrounds. The plane met with approval from J.D. McCurdy, an assistant to Glenn Curtiss (of Curtiss airplane fame) and word spread rapidly about the plane. After a couple of miscues because of weather, the plane was finally flown on October 21, 1910. It was placed in a hangar for the winter, with big plans for a huge event in the upcoming June. Unfortunately the hangar was struck by lightning and the entire structure and the plane were consumed by the flames. There lies the sad demise of the Delaplane. This year marks the one hundredth birthday of the Delaplane and the Delaware Aviation Hall of Fame will be celebrating. 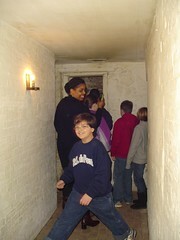 Don’t miss out on the fun and the rest of Delaware’s history, check them out at http://www.dahf.org/. This Delaware Historical Society is so glad to know it owns the only know photograph of this plane. A New Kind of Club…. 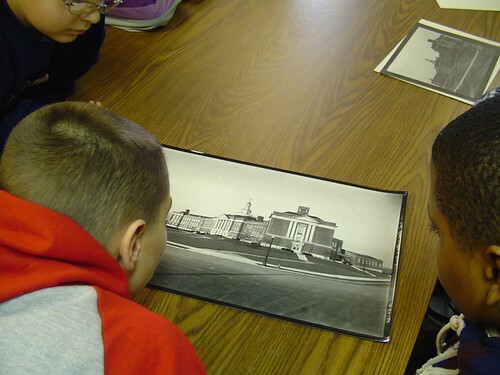 Students Examining Old Image of Their School, originally uploaded by Delaware Historical Society. I am very excited about a new partnership between the us here at the Delaware Historical Society and middle school students and P.S. DuPont. Together, we have formed a history club. 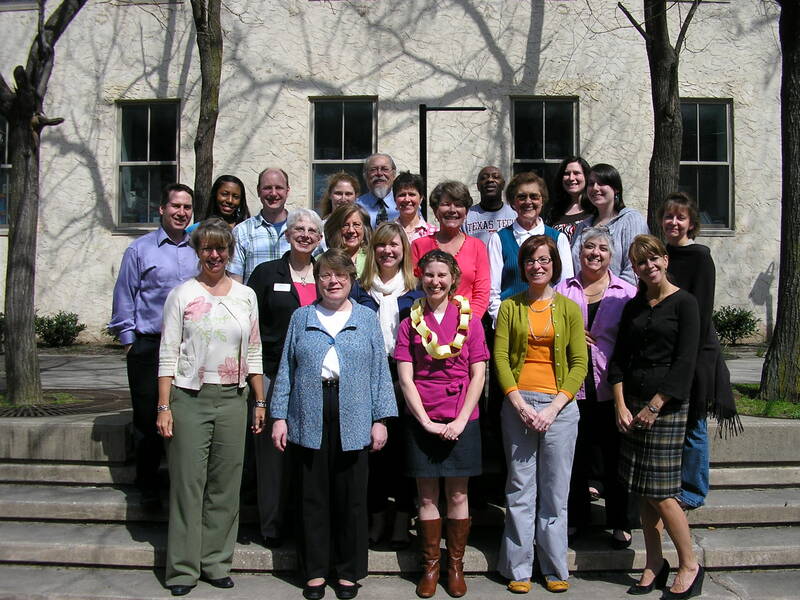 The club was the idea of Kelly Whitaker – an absolutely extraordinary 6th grade teacher! Because P.S. DuPont just switched from an elementary school to a middle school – she thought having a history club would be a great way to build a sense of community, history education…and FUN! We had a great group! For me, it was exciting to hear the students talk about when they visited the museum in 3rd grade or 4th grade for a field trip. I was impressed (and thrilled) by how much they remembered. 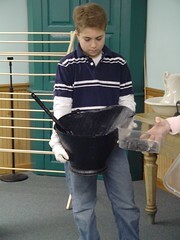 Most rewarding, was watching the students feel comfortable in the museum and begin to take ownership of it. The museum is – after all – a place for them, their histories, and their stories! I’m looking forward to our February meeting where we’ll be learning about the Underground Railroad. 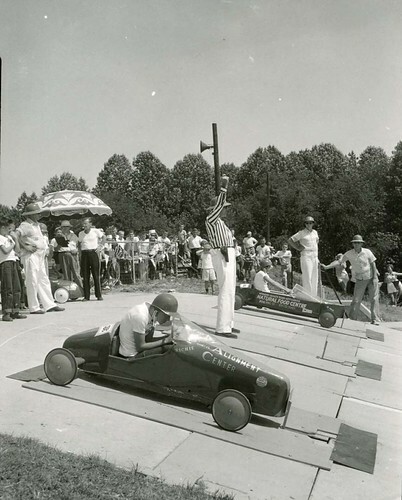 Ready, Set…Go!, originally uploaded by Delaware Historical Society. Hello from the photo files! I am working on the finding aid/cataloguing a large collection of photographs from a photographic studio here in Wilmington. Lubitsh and Bungarz Photographers operated first from Market Street then from Orange Street in Wilmington from 1949-1989. The negative collection is monster-big. A volunteer spent a few years identifying the prints for us and now I am working to her work into our catalog. There are probably somewhere in the vicinity of 2000 prints of some very cool happenings, places and people. Everyone from this little boy who raced and placed in the 1955 Pushmobile Derby sponsored by the Delaware Association of Police, to the Pope John Paul II, a couple of Miss Delaware contestants and Presidents Eisenhower, Nixon and Kennedy. The collection includes images of both of the Delaware Memorial Bridges being built, views of homes, banks, businesses, ground breakings and numerous civic ceremonies as well as views of the Getty Oil Refinery (most recently Valero) in Delaware City, scenes from Brandywine Raceway and aerial views from across the state. What a fun collection it is! It is also very significant to us because it picks up almost exactly where the Sanborn Studio (our other very large studio collection) left off. Photographers are some of the very best documenters of history and this is certainly true of Lubitsh and Bungarz. The Bungarz Print collection, named as such because it was a gift to the Delaware Historical Society from Jack Bungarz after his long-time partner, Cypen Lubitsh had died and as he was retiring from the business, is a rich treasure of everyday scenes and important events, as such it is an indispensable resource for all of us. Come down to browse through the boxes or check us out on-line in a few months! Until next time- enjoy 11:45! Help us identify this image! 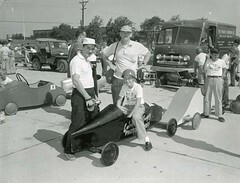 This little boy raced in the Pushmobile Derby in Wilmington in 1955. He drove the car sponsored by the Lubitsh and Bungarz Photographers. Partner Cy Lubitsh is seen posing to the left of the boy on his car- is this his son? We don’t have an identification- anybody out there who could help? 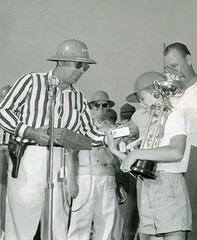 The boy was apparently good, as he is seen here in the second image accepting his prize from the race officials. The Delaware Association of Police sponsored the event which featured the work of local boys in cooperation with local businesses. Making History 11:45 is a project to document the life and work of the Delaware Historical Society and the people who work there. We want to share our love of Delaware history. We want to engage our community and invite them to participate. We want to get people excited about Delaware History! Brittany on Too Cool Not to Share!